You may know the name Scott Sterling from a video titled "Top Soccer Shootout Ever With Scott Sterling," a very funny sketch by Studio C, a comedy TV show on BYUtv, which featured a soccer penalty shootout. It was a penalty shootout with a difference though, and the difference was Scott Sterling's face (Sterling is played by actor Matt Meese who wrote the sketch) which saved all the penalties for his team the Yale Bulldogs. Shot after shot his face comes between the ball and the back of the net until victory, and unconsciousness, looms. The sheer absurdity of the concept and poor Sterling's increasingly battered face, along with the hilarious commentary, made sure it went off the scale in the viral stakes. And now, a couple of years later, Studio C have made a sequel. 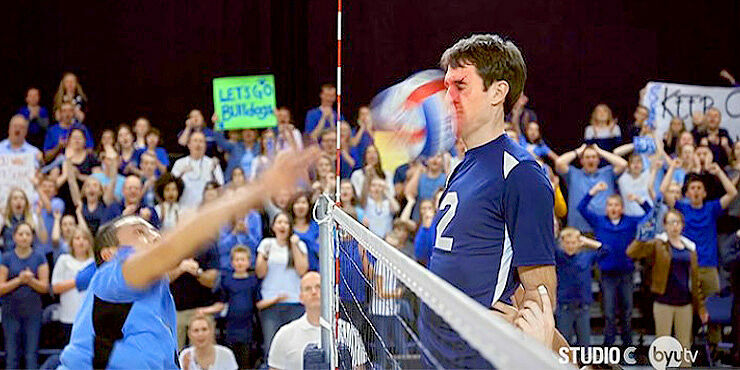 Again Scott Sterling's face is the savior of the Yale Bulldogs, but this time the game is volleyball. And it's equally as funny as the penalty shootout. Sterling's face repeatedly takes a hammering as the ball gravitates towards it again and again, deflecting it back to his opponents, the North Carolina Tar Heels', court. Eventually knocking Sterling to the floor, where the ball continues to bounce off his head until his team mates lift him up to the net to finish the game, and Sterling, off. It ends, just like in the previous video, with the greatest face in sport leaving the court on a stretcher. A legend to the last.